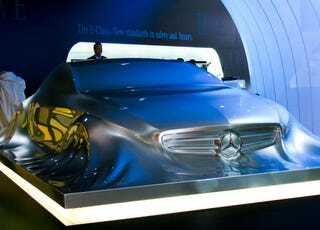 This sculpture previews the 2012 Mercedes CLS. Basically, it's looks like the current CLS with a lower rear, more exaggerated lines and the grille from the SLS AMG, all of which is a good thing. Don't ask us why Mercedes chose to preview the car with a sculpture, but we can only assume it owed the company money and this will all culminate in a hover battle over a big sand worm. The CLS was the car that started the whole nonsensical, yet good-looking four-door coupe thing, so expect the production vehicle to again make Jaguar look bad by offering a lithe four-door that puts looks first and practicality last. Expect to see that A-class-sized Merc badge on more Benzes too.